Kara is an impeccable, dependable and hardworking young women. She has earned the 2017 All-Area Academics Athlete of the Year, the Prescott Triple Threat Athlete Award & several more outstanding awards. This Prescott High School student has maintained a 4.0 GPA all while participating as a three sport athlete and the schools spiritline team. In addition to athletics, Kara has been quite involved with her school and community. 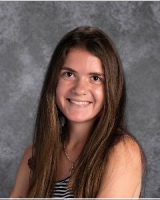 This astonishing student serves on over 20 clubs which include National Honor Society, S-Club Soroptimist International Chapter, Academic Honors Club, Fellowship of Christian Athletes, Thespian Club and the Orchestra club to name a few. Throughout her athletic career, sports has taught Kara many lessons on being sportsmanship is the fair and generous behavior or treatment of others. She helps her teammates in all situations & gives them encouragement, Kara is the top role model at Prescott High School and in her community. She has put hundreds and hundreds of community service hours and assists her school helping staff and administrations with new student orientations, information days and semester set up. Kara will surely excel in her college career and continue to help her community. Kara plans to attend either Arizona Christian University or University Arizona to study medicine.